Today, August 25, 2015, typhoon 15, GONI（コーニー）is blowing over Kyushu and close to my home. A good time to check about typhoon legends . . .
Today, September 20, 2016, typhoon 16, MALAKAS（マラカス）is blowing South of Shikoku and close to my home. 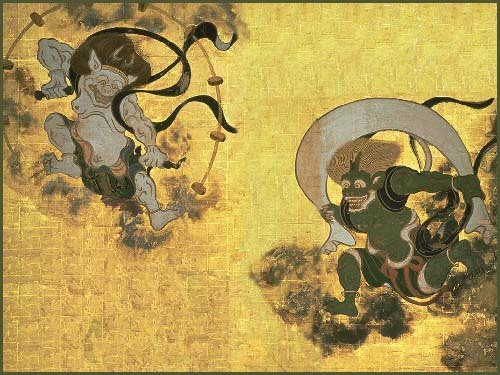 Since a typhoon does bring a lot of rain, it is also associated with the Dragon Deity, ryuu　龍　- 竜 Ryu. In Japan, typhoon is a season word for mid-autumn, mostly September when most of them hit the islands.
. The Wind God, Fuujin 風神 Fujin、Fuuten 風天 Futen .
. Fuujin 風神 Fujin、風天 Futen - 風神伝説　Wind God Legends .
. funadama, funatama 船玉 / 船霊 / 船魂 guardian deity of a boat . becoming the strongest and deadliest typhoon on record to make landfall on the country. At the time of the Isewan Typhoon, a strange light (kitsunebi 狐火) could be seen like playing hide and seek.
. yonaki matsu よなき松 / 夜泣き松 "Pine crying at night" . The Juunitenjin no hokora 十二天神の祠 small Shrine for the 12 Protector Deities had been moved during the construction of a dam. During the Isewan Typhoon the Shrine has been blown away and the gable amulet (munafuda 棟札) was lost. The villagers held a meeting about what to do now. At that night, 青柳光平 Aoyaki Mitsuhei had a dream about a serpent with one head and 12 bodies was winding around a human skull. The next day all went out looking and found the gable amulet. Now they could erect a new Shrine.
. Jûni Ten, Juni Ten 十二天 Happoo Ten　八方天 12 protector deities .
. goshiki ryuujin 五色龍神 Ryujin, Dragon God of five colors . and the 老松 Old Pine.
. ha no kamisama 歯の神様 Deity of Teeth. .
During a typhoon or any other situation of danger at sea, it is best to show the white flag of 播州池田の観音様の白旗 the Kannon from Harima Ikeda. But this flag helps only once. 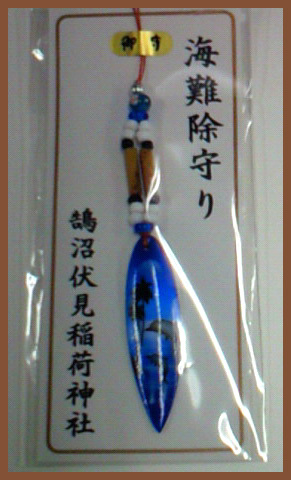 An amulet from 金刀比羅様 Konpira in Shikoku is also helpful. CLICK for more amulets ! In 1806 on the 12th day of the 2nd lunar month a strong typhoon hit the village. But the area around the shrine 白庭神社 Shiraniwa Jinja showed almost no damage. The villagers thought this must have been the benevolence of the Deity and arranged a festival to pray for prevention of further damage to the village.
. Shipwrecked help from amulet of Fudo Myo-O . nihyaku tooka 二百十日の風祭り wind festival on the 210th day. On this day farmers do not work to avoid a typhoon coming up, and instead enjoy a "wind festival".
. The lunar calendar festivals - August . "一つドンドロ大風のもと" one Dondoro is the beginning of a great wind, Typhoon. 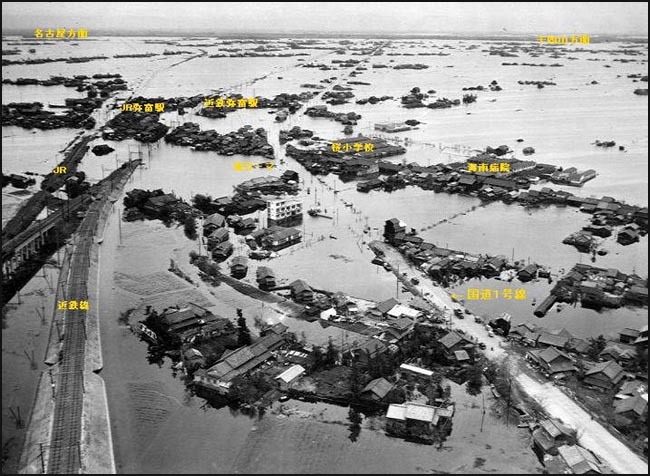 In 1952, during the time of ルース台風 Typhoon Nr. 15, Rusu, a young nurse in white robes and a young doctor in white robes, both without legs, where seen leaving the clinic. Someone heard a knock at the door and a voice calling "Is the wife at home?" but when she looked outside, there was nobody to be seen. The door closed all by itself with a loud noise later there was a telephone call from the clinic. A man had tilled his fields and sown a lot of millet 稷. When it had grown quite a bit the sea turned wild and a great wind begun to blow. He thought a typhoon was coming and wanted to harvest the green crop in the time left before the storm hit. Suddenly Amuro, a Heavenly Maiden, showed up and asked why he was going to cut the green millet. When he told her about his worry about a coming typhoon, she answered "This is just a regular seasonal wind and not a typhoon!" He wanted to see some proof of her words, so Amuro made him promise not to tell anyone and then gave him the evidence. On his way home the man met a friend and told him everything. To punish him for breaking his promise, the gods made him blind from that day on. In the Edo period, a Rokubu pilgrim and his daughter tried to pass 上村の番所 the barrier at Uemura. But they were not allowed to pass and jumped from ダグリの岩 the boulder of Daguri into the see to kill themselves. To our day this spot is called 六部瀬 "Rokubu-Se", Rokubu Shallows. The Rokubu had carried some foxtail millet, which soon begun to grow near the boulder. The villagers of 下村 Shimomura built a grave for the Rokubu. The place of the barrier is still to be seen. During a typhoon, the sound of a pilgrim's bell can be heard at the grave of the Rokubu. People say this is 六部うらみの歌 the song of the grudge of the Rokubu.
. rokubu 六部 Rokubu pilgrims . Once the old pine in the army graveyard broke down during a typhoon. Since a few days before that event, the villagers saw a 赤い火の玉 strange red ball of fire above the tree. They thought it must have been the spirit (セー(精霊) -タマシ(霊)) of the tree. when many typhoons haunted the region, people decided to built a dam and bury a human being in it as offering (人柱 hitobashira ). They stared the work and the first girl who brought food to the people should be offered. Thus the daughter of the village elder, お竜 O-Ryu, was buried alive. Since that time, the river bank never broke. And the pond was called 竜が池 "O-Ryu's pond". If someone walks past below the dam and called "Hey, O-Ryu", there would be a strange voice answering: "Yes!".
. Hitobashira 人柱 human pillar . When the tookibi トウキビ, tomorokoshi トウモロコシ corn grows fast, there will be flooding. When its roots grow long, there will be storm and flooding in this year. When the 西瓜 watermelons grow well, there will be many typhoons in this year. 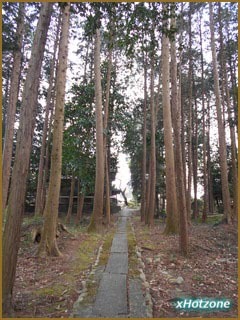 On a hill above 清武川 the river Kiyotake there was a huge pine tree, usually called the 天狗松 "Tengu Pine". It often lost branches when a thunderbolt struck it, but finally it fell down during a typhoon.
. Tengumatsu 天狗松 Tengu Matsu pine tree . 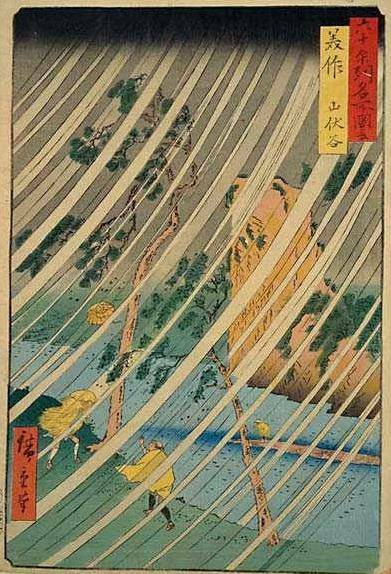 yamaonago, yama onago 山オナゴ "the mountain girl"
One day when a typhoon approached, a young schoolgirl had her umbrella blown away and begun to chase it. But she fell into the river and drowned. The old women of the villge say this was the malicious deed of the Mountain Girl. Once upon a time, a plum tree fell down during a typhoon. The farmer tried to bind another tree to it to keep it up, but after that he caught a cold and high fever. 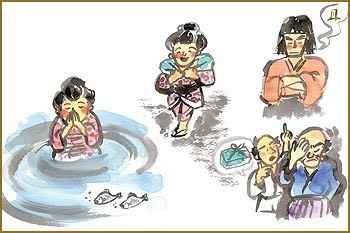 That night a woman like a beautiful princess (named お香さん O-Ko san) gave him 薬の玉 a ball of medicine. When he drunk it, he felt healed next morning.
. Koshin Cult 庚申信仰 - Introduction . During a typhoon, fishermen were drifting, lost off the coast. Suddenly there was a shinka 神火 "divine light" and showed them the mountains and way to the harbour. So all came home safely to 仲宗根港 Nakasone Port. 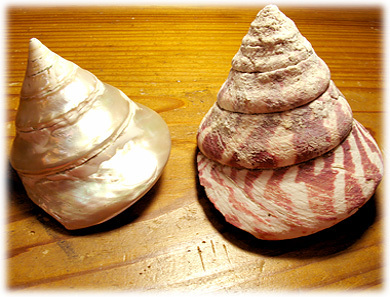 A fishing boat got a hole in the bottom and was about to get shipwrecked, when suddenly some takasegai 高瀬貝 trocas shells clung to the bottom and closed the hole. The fishermen could reach the beach safely. This trochus shell family: Trochidae is used for shell-button production.
. Tanuki no Kuro San 狸のクロサン Kuro-san, the Tanuki . After the huge typhoon named 狩野川台風 Kanogawa Typhoon in September of 1958 along the Izu peninsula someone said he had seen a ghost at 熊坂 Kumasaka. He had seen an old woman carrying a furoshki packet on her back, leaning on a bamboo walking stick. He wanted to talk to her, but she only mumbled an answer in a very weak voice. After he walked past her and turned back to take another look, she was gone. A taxi driver tells of a young woman who had hired his taxi for a drive to Kumasaka. When they arrived there, the woman was gone, but the seat was all wet. The taxi driver was so afraid, he fell ill for three days. Another man was walking along Kanogawa in the evening, when he met his friend and they talked for a while. Later he learned that this friend had died in the flooding in the morning of that day. The fishermen had trown out a woman on the boat to stay on the island to prevent their shipwreck. But they never came back to get the woman home. The woman died in anger and pain and her long hair turned into a serpent.
. tsunjikaze つんじかぜ wind calm at Edo castle .